We've been celebrating ever since we found out that SSD Midge is going to have puppies. 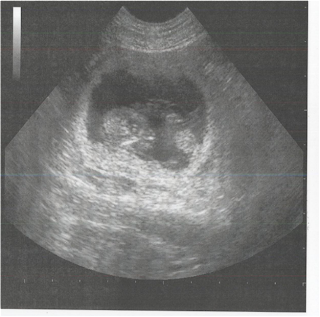 It has been a while since our last litter, the Crayon litter, and we're very excited. 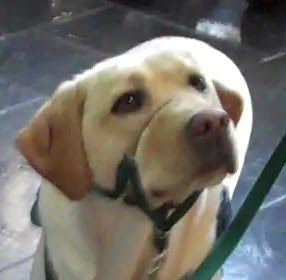 Midge flew all the way to California to be bred with a handsome dog named Paxton from Canine Companions for Independence. She spent two weeks with him, and the end result is puppies! The ultrasound revealed six puppies, which gives us an idea of how many to expect around May 24, when her puppies are due. 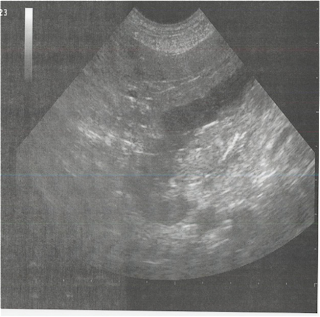 It you'd like to see sonograms of all six puppies, read our Puppies! post. This is her first litter and as a new mother-to-be, she needs lots of encouragement and well wishes. Use the comments to write her a note of encouragement and let her know what a good girl she is! We'll make sure she hears every one of your messages. Midge's puppies will be born in the spring, but when Midge herself was born, winter was just starting. She was born on December 1, 2007 in the Adirondacks. 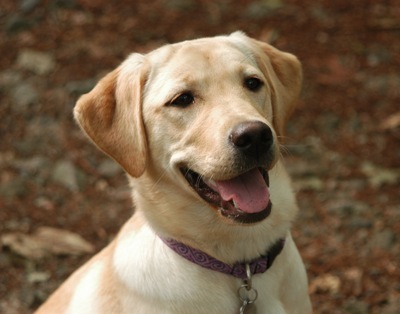 Her mother is Cinder's SSD Stellar Choice, and her father is a dog named Mark from Guiding Eyes for the Blind. Midge belonged to the Small litter - all of the puppies were named after small things. Some of her brothers and sisters include SSD Lil, Gnat, Mite, and Natalie (formerly Barely There). Many of her brothers and sisters are now working service dogs. We chose Midge as a breeding dog for many reasons. 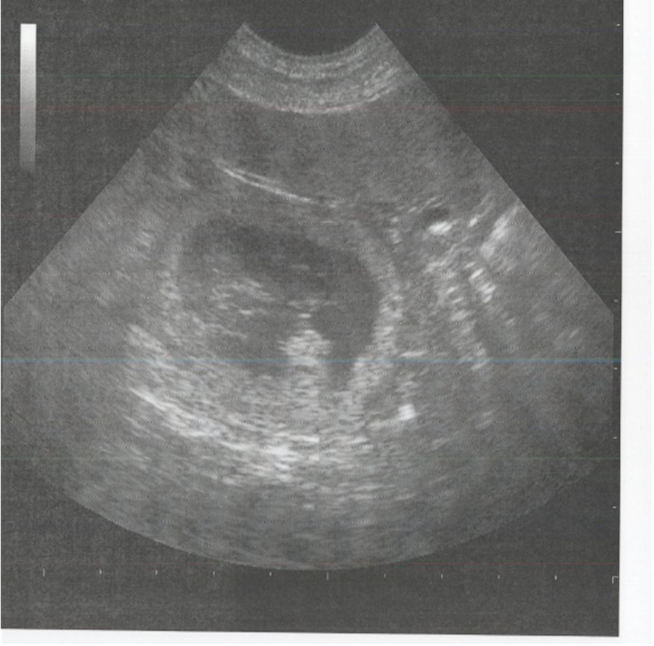 She has excellent hips, good health clearances and a wonderful temperament. When she spent time at the kennel, she was perfectly relaxed and did not get stressed, and she trains well, which is a tribute to both her and her puppy raisers. 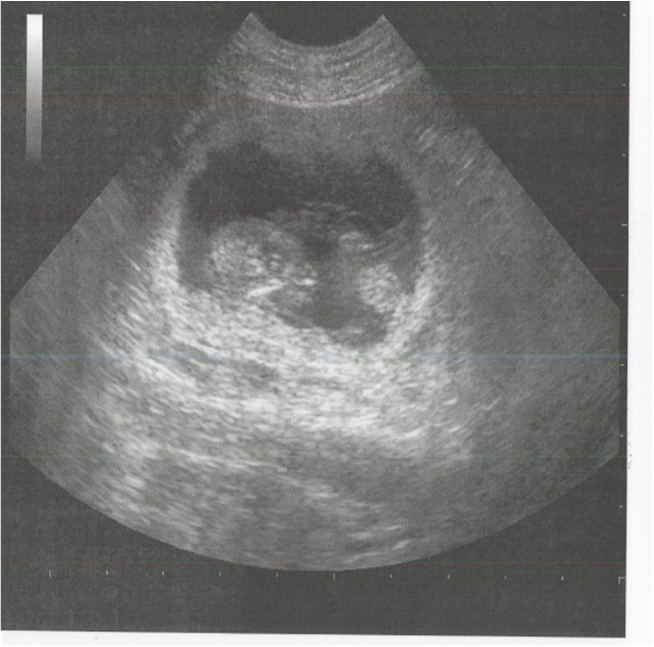 We believe that she will improve the genetics of our dogs. All of our litters have a theme when it comes to naming the dogs. We'll be revealing the theme of Midge's litter soon! Don't forget to leave a note for Midge! SSD Shamrock and the other puppies from the Crayon litter are seven months into their training to become service dogs. In about a year and a half, they could be placed with their partners as official working service dogs. It's a long road to get there, full of hard work and lots of fun. How would you like to be part of their journey? Join us for the Highmark Walk for a Healthy Community on Saturday, May 22 at 9 a.m. on City Island in Harrisburg, PA. Thanks to Highmark Blue Shield, all of the money we raise for the Walk goes directly to SSD. 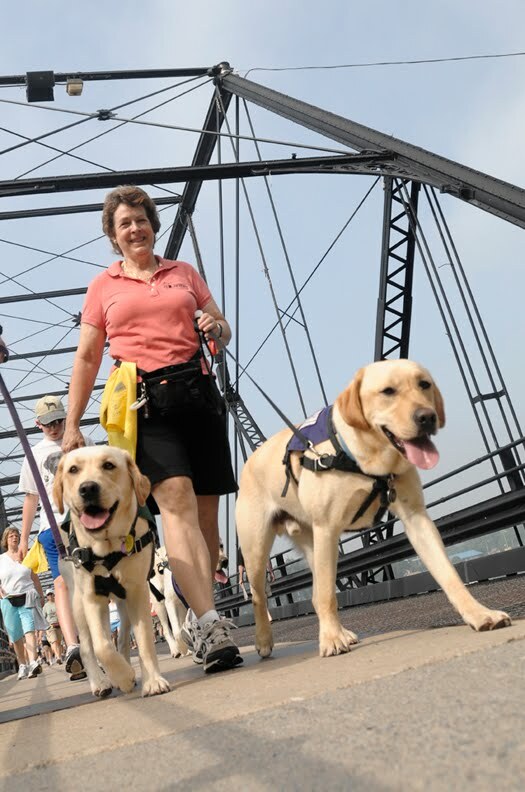 Our goal is to raise $20,000 - the cost to raise, train and place one service dog. 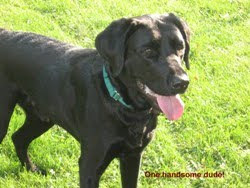 By participating, you could help Shamrock become a service dog! Select Susquehanna Service Dogs as your charity. 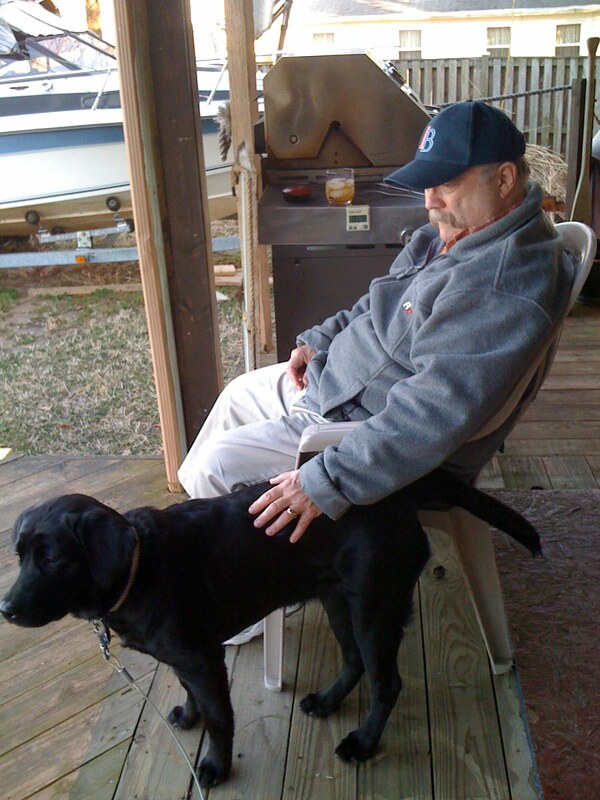 Raise money to benefit a service dog. Join us on May 22 for the Walk! The Walk is accessible. 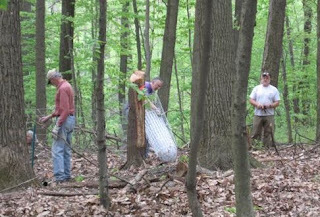 After the Walk, we'll have ea picnic for all of our participants! We always have a great time, and the dogs love it! We hope you'll join us and help Shamrock and his brothers and sisters become service dogs! SSD Midge had her vet appointment today, and we received great news! She's going to have puppies! 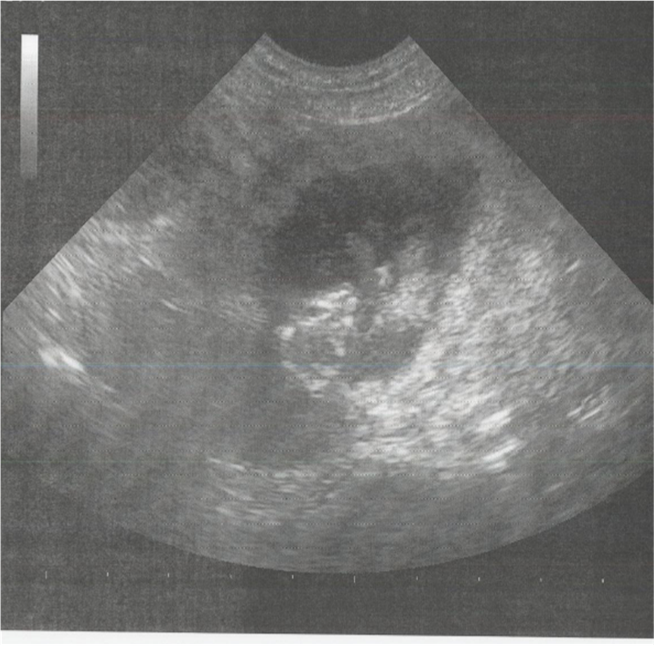 The ultrasound revealed six puppies, although that isn't a definite number. 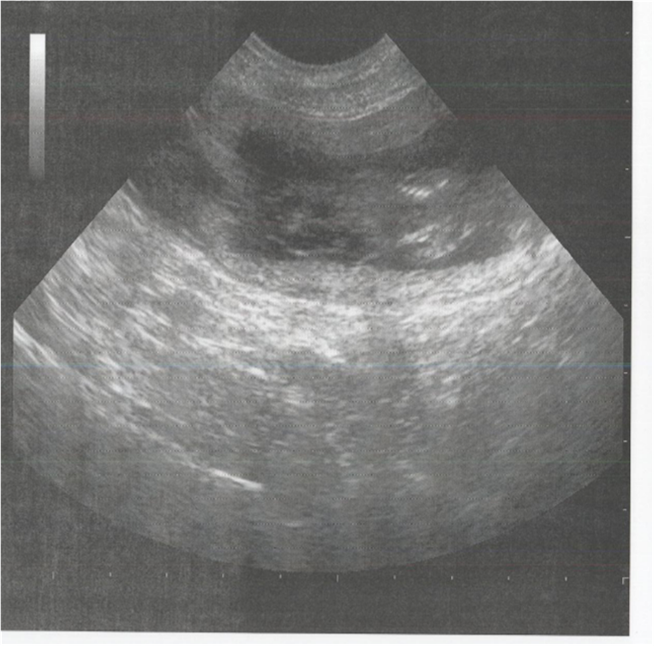 A puppy could be hidden behind another one, making it difficult to see on an ultrasound. 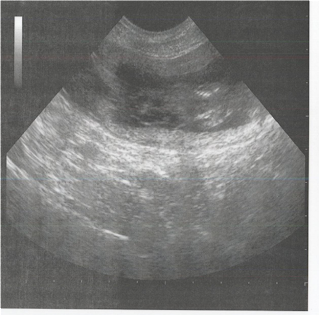 The images give us an idea of how many puppies to expect when Midge is ready to give birth. Midge was very calm through the whole process. While waiting in the lobby at the Palmyra Animal Clinic, she sat or lay quietly. 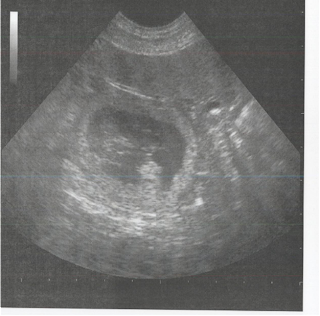 During the ultrasound, she lay calmly on her back, and when it was over, she seemed perfectly content to just continue lying there. Although Midge is one of our female breeding dogs, she also has another job. She works as a therapy dog. During her pregnancy, however, she's not going to work, even though she loves it. We're going to do everything possible to prevent a miscarriage and make this a smooth pregnancy. In another month or so, we'll hopefully have puppies! Congratulations, Midge! What an exciting day! It may have been a dreary weekend, but the kennel is sparkling! Thanks to a group of wonderful volunteers, we cleaned everything at the kennel during our annual work weekend. We got everything done on our to-do list except removing the rust from the crates and the outside runs and painting the crates. The only that stopped us from finishing these tasks was the weather. The rain finally put a halt to our cleaning. 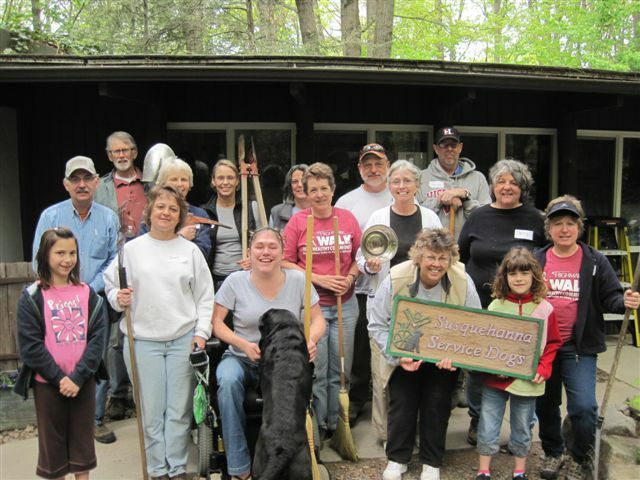 Thank you so much to everyone who helped us this weekend! You did a fantastic job! We know that you worked hard this weekend, but we have one more thing to ask of you and everyone else. Don't worry - it's much easier than putting up a fence. SSD Midge is going to the vet tomorrow for an ultrasound to see if she's going to have puppies, and we need you to keep your fingers crossed. Here's hoping for puppies! "Can a 60 or 80 pound dog really change someone's life? Yes!" So said Jennifer Arnold, the founder of Canine Assistants, in the PBS documentary Through a Dog's Eyes, and we whole-heartedly agree. 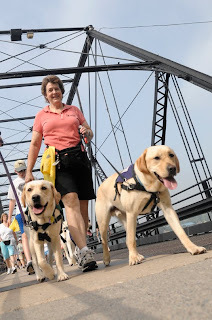 Through a Dog's Eyes aired last night, and it was such a heart-warming documentary about service dogs and the special bond they have with their partners. 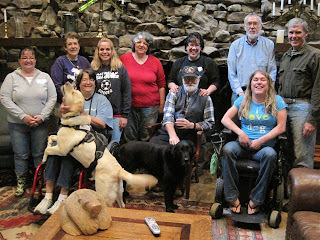 It told the story of Canine Assistants, a service dog organization in Georgia. The film focused on Canine Assistants' training camp, which is where people meet and choose their service dog and then go through two weeks of training. We will never get tired of seeing bonds form between the partners and their dogs! It was wonderful to see the relationships and deep bonds forming as each person worked with their dog at the training camp. We also got to see people's live change because of their service dog. The dog of a young girl who has epilepsy alerted her and her parents that she was going to have a seizure in the middle of the night. A young boy with cerebral palsy may be able to walk without a walker, with the assistance of his service dog. "They have hope," said Jennifer Arnold, "and the hope comes from these dogs." What did you think of Through a Dog's Eyes? Share your thoughts with us in the comments. What's the secret to having a dog that loves to have her teeth brushed? Make the toothbrush a toy! At our puppy lecture, we discussed the dogs' sensitive areas, including their teeth. Many of the dogs don't really like to have their teeth brushed. Onyx, however, has no problem with it, and her puppy raisers share their secret with us. 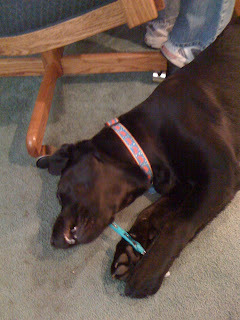 Onyx loves to watch Carol brush her teeth, and one morning, Carol gave her a toothbrush, just to see what she would do with it. Onyx took it right away, ran off and started chewing on it. Carol realized that to brush Onyx's teeth, all she had to do was move the toothbrush around while Onyx was chewing on it! Onyx doesn't even realize her teeth are being cleaned because she's so busy chewing on her toothbrush "toy." Some of the other puppy raisers are going to give this a try and see if it works for the dogs they're raising. What an easy solution to make tooth brushing fun for dogs and handlers! Onyx plays tic-tac-toe and more! At puppy class, SSD Onyx and the other dogs played tic-tac-toe. We split into teams of black dogs and yellow dogs - the first team to get three dogs in a down or sit in a row, won! It wasn't as easy as it seemed, however. If a dog got up, they had to leave the board. Onyx did very well - she went down in one corner and stayed there, thanks to the power treats Carol gave her (cheese whiz!). However, it proved too difficult for the dogs to play by normal tic-tac-toe rules, so we changed them. Instead of one team winning by getting three in a row, we just wanted to get all the dogs on the board in a row of yellow and a row of black. We cleared the board and started over. Onyx was the last black dog on the board, but in order to complete the row of black, she had to sit next to Sienna - her favorite yellow lab playmate! It was difficult for Carol to keep her attention focused. It's a challenging game because the dogs need to pay attention even though there are other dogs in very close quarters. Onyx is always thinking. 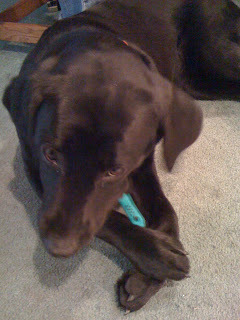 She loves to put things in her mouth, and while she doesn't necessarily eat them, she has discovered that she'll get a treat if she gives it back. It has almost become a game for her - grab something she isn't supposed to have, run off with it, wait to be asked to give it back, and get a treat. Recently, her puppy raiser Mark was grilling outside, and he dropped the can of spray oil. Onyx grabbed it and ran inside. She stopped halfway up the stairs and looked back at her other puppy raiser, Carol, as if to say, "Aren't you going to stop me? Don't you want this back?" When Carol walked toward her and called for her to come, she came down the stairs and dropped the can at Carol's feet so she could get her treat for giving it back. 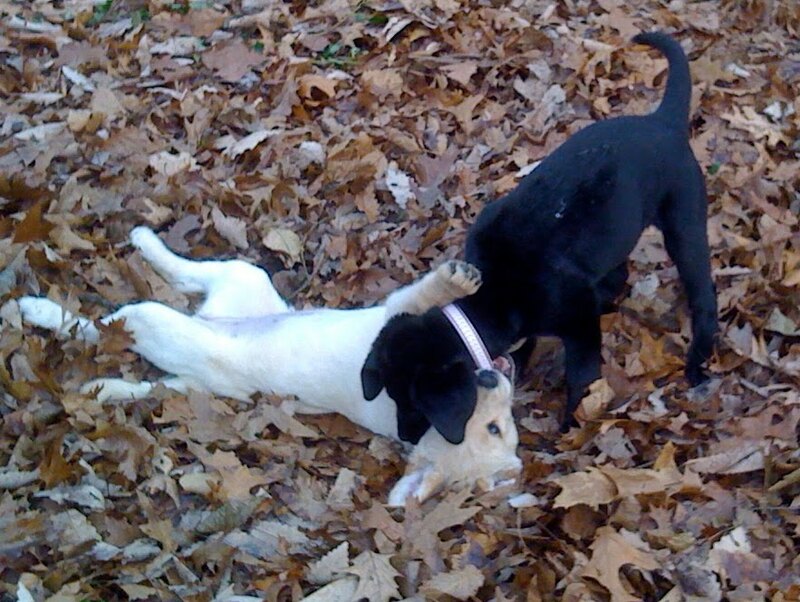 Onyx is always keeping her puppy raisers on their toes. In puppy class, we've been working on get dressed, which is the cue for the dog to put its head through its service dog harness. 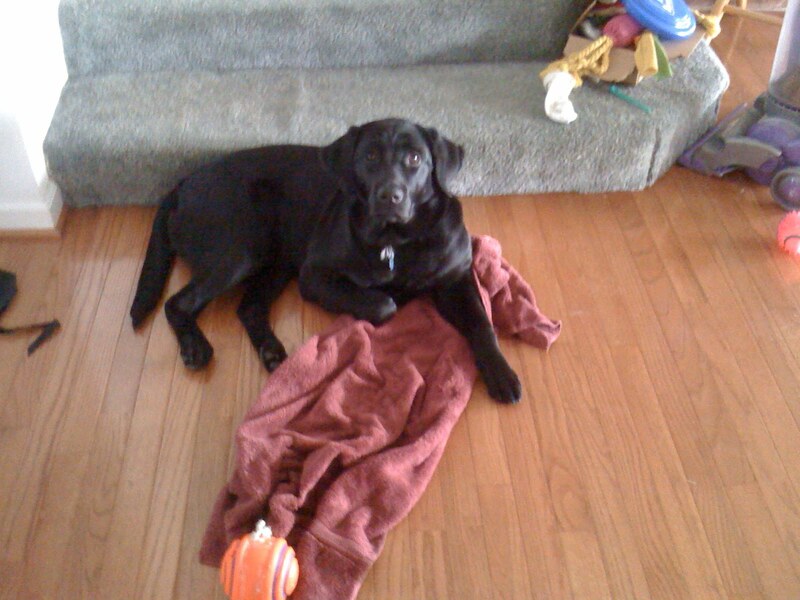 Carol and Mark have found that Onyx will only do get dressed if they have power treats such as chicken or hot dogs. When we're training the dogs to do a new cue, we sometimes have to "up the ante" in order for the dog to perform the task. That usually means using better treats rather than just the dog food they typically get. Mark and Carol area also working on visit. Onyx visits very nicely for Mark and Carol, putting her head in their hand or lap. Now she needs to work on visit with other people. She won't always be with her puppy raisers, so she needs to learn to perform behaviors when other handlers give her cues. We'll keep you updated on her progress. Onyx has actually turned visit into a way to beg for food. She has perfect manners when Mark and Carol are eating at a table. But when they're eating anywhere else, Onyx begs. For example, if Carol is eating in a chair on the porch, Onyx will put her head in her lap and stare at her. She never gets any food using this method, but she's still in the stage where she's trying. Eventually, she may realize this behavior doesn't get her any food and she'll stop. We've been discussing the dogs' sensitive areas, such as their teeth. Many of the dogs don't really like to have their teeth brushed, but Onyx has no problem with it. What's the secret? Find out tomorrow! What do motorcycles, fishing rods and a newspaper have in common? They're all new things Nubble has encountered. With the nice weather, people are starting to take their motorcycles out. At first, Nubble was enthralled with them. Now he ignores them. It may have helped that Donna's son Zac was playing catch with Nubble while riding a dirt bike in the yard. Nubble didn't chase the bike or even really get distracted by it. Instead, he focused on Zac and the ball. On the first day of trout season, Nubble went fishing! He went with Donna and Lindsey and sat next to them while they fished. To keep him occupied, they gave him a bone (not a fish bone!) to chew. Afterward, he got to go swimming in the creek. Nubble loves the water, especially playing catch in the water! Donna and Lindsey practiced recalls with him, and he did great! What a happy, muddy dog! Donna continues to take him to the grocery store with her. This time, there was a newspaper blowing in the parking lot. Nubble could not figure out what it was, and he barked and barked at it. As they moved closer to it, it kept blowing away. Finally, they got right next to it, and Nubble pounced. After that, though, he left it alone. It took a little while to focus him to go into the store, but once he settled down, he was very well behaved. Stairs still present a challenge for Nubble. He either refuses to go up or bolts all the way to the top. Donna only has three porch stairs, and Nubble always runs up them. As a service dog, he will need to walk in a controlled manner up and down stairs, so Donna plans to continue working with him on stairs. Loose leash walking is also a challenge, especially as he gets stronger. Meg, the SSD Northeast Division coordinator, gave Donna some advice that really helped. Now, Donna is holding the leash close to her body, rather than relaxing her arm, and what a difference it has made! They walked a 2-mile loop in town, and Nubble walked on a loose leash 75% of the time. Great progress! He's still sniffing everything, but now he isn't pulling. Fire hydrants no longer bother him, either. He completely ignores them in town. He is working in place, which is similar to heel, except the dog moves to the right side rather than the left side. So far, he seems to be getting it. Donna is using the purple platform to help in training. Nubble gets up on the platform and shifts until he's in the proper position. Although he's not ready to try it without the platform, the training is progressing very smoothly. Other cues he's getting very good at: car and go on through. The dogs must wait patiently at the car until they're given the cue (car) to get in. They must also wait to be told they can exit the car. Go on through is used at doors. The dogs are supposed to wait for the cue before going through the doorway. Once the cue is given, they should go through and turn around to look at their handler. Nubble's go on through has definitely improved. Donna is still working on doorways in the house, however. He doesn't seem to understand that they are doorways, too. But he's started to get the idea. What will he learn next week? SSD Midge is back from California, where she was bred to a dog from Canine Companions for Independence. It will be a week or so before we find out whether Midge will be a mother, but in the meantime, she is continuing her work as a therapy dog. 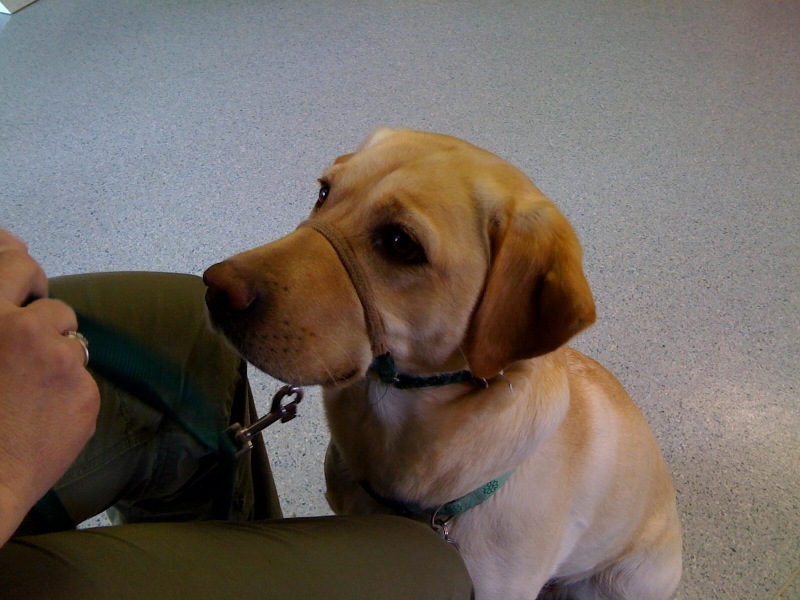 On Wednesday, Midge met with a child with autism for a therapy visit. Our therapy dogs visit classrooms, reading programs, the psychiatric and antepartum units at the hospital, retirement homes and nursing homes, and work with children with autism, pregnant women, people with psychiatric disorders and people with Alzheimer's. Wednesday's visit, however, was a little different than many of the other visits our therapy dogs make. This visit was different because this child and her family have applied for a service dog. When families apply for a service dog for their child with autism, we want to make sure that a service dog will be beneficial for that child. Families meet with a therapy dog, such as Midge, in four different sessions. Not only do these therapy sessions let the family learn about the realities of a service dog and the ways a dog can support their child, but they also give us the opportunity to learn more about the child's needs. This helps us match the child with a dog. Working with Midge in the therapy session today brings this child one step closer to receiving a service dog. We're clicker trainers. It's a positive reward training system, and it's fun for us and the dogs, especially since we use food rewards - and you know how much Labs love food! Since we started using clicker training, we have found that the dogs are very eager to learn and experiment with behaviors to find the one that will earn them a click and treat. The dogs learn very quickly using the clicker method. However, it's the trainer's responsibility to make sure they're sending the right signals to the dog. 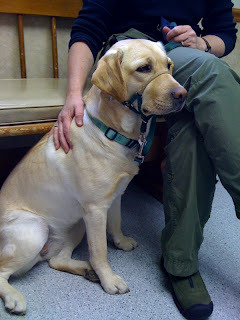 Rebecca Lynch, a dog trainer who is a Karen Pryor Academy Certified Training Partner, wrote a great article about what she calls "poisoned cues." 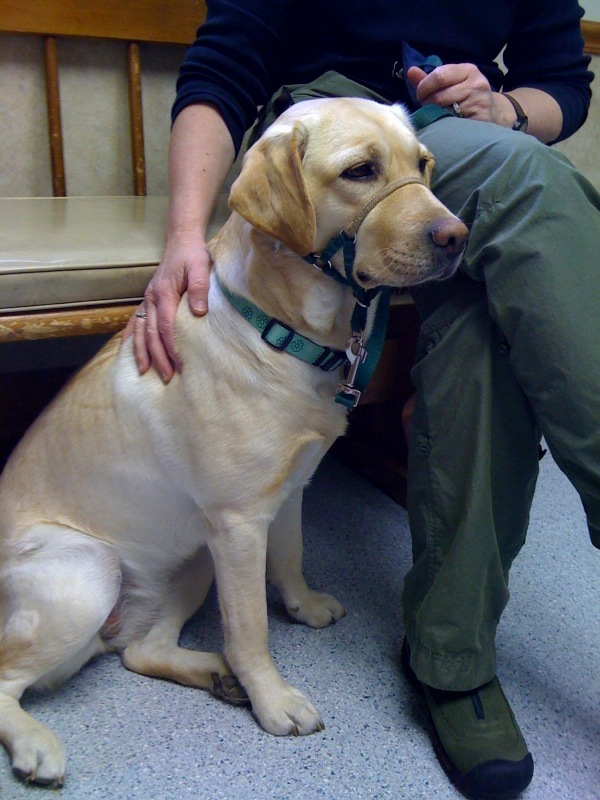 A poisoned cue occurs when a dog associates something unpleasant with a cue. The dog may stop responding to the cue in an attempt to prevent the unpleasant thing from happening. For example, the cue come can easily become associated with something unpleasant because come tells the dog to stop sniffing all those wonderful smells or stop playing with those dogs and return to its handler. The dog is not going to come if come always means the fun stops. When we train come, we may use power treats to help make us more interesting than the great smells or other dogs. When the dog comes when called, we'll give him a jackpot of treats and then release him to play or sniff again. The dog will associate come with good things (treats) and learn that come doesn't always mean the fun ends. Rebecca Lynch's article Poisoned Cues: The Case of the Stubborn Dog goes into detail about reading your dog's body language, identifying poisoned cues, and retraining those cues. It's a great read and really makes you think about the little details about clicker training your dog. Have you ever retrained a cue when it had stopped working? We would love to hear about it. Share your story and tips in the comments. The votes are in, and you've chosen a winner of our Dogs Change Lives contest. Congratulations to Michele and Grizzly, the winners of the Audience Choice Award! Grizzly is a companion dog for Michele's son Collin, who was diagnosed with autism at age four. Since Grizzly has joined their lives, they have seen so many positive changes in Collin's life. Read the full story about Grizzly. Our judges have been reading all of the stories and they have selected a winner of the Life-Changer Award. This award goes to the most compelling story of the impact a dog has made in a person's life. Congratulations to Dana and Lex! 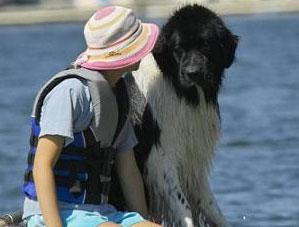 Read the story about Lex, the Newfoundland that changed Dana's life. We would also like to congratulate our ten runners up. Each of these incredible stories received a Susquehanna Service Dog stuffed toy. Read these stories. Congratulations to all of our winners! And thank you to everyone who submitted stories and voted! All of your stories are wonderful tributes to the amazing way dogs change our lives.